Feathers are birds clothes, worn at any occasion. For humans, feathers are most commonly used in disguise, either inside jackets or bedding. In Fall-Winter 2013-2014 fashion shows, however, feathers claimed a “visible” spot in the limelight. Designers decorated with feathers many garments and accessories and also introduced their glamour into Hollywood’s film industry. Everyone remembers, in “The Great Gatsby” film, Miuccia’s Prada feathered bolero Daisy Buchanan (played by Carey Mulligan) wore to attend Gatsby’s big party. Looking at pictures of models on runways and actresses on films, however, makes you wonder whether they can be worn in everyday life. Can a woman wear feathers for going to work, shopping with friends or on a night out with their partner without risking looking like she just escaped from a bird’s cage? The answer is yes! All of us, even the most reserved, can find a way to introduce them into our wardrobe. Designers used feathers on coats to dresses to shoes to handbags even jewelry. Dries van Noten and Proenza Schouler presented feather skirts worn with knitted sweaters, Oscar de la Renta created evening gowns with silky flowing feathers and Nina Ricci used feathers on handbags. Clothes: Many designers used feathers to cover their models from head to toe. 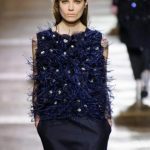 Others preferred to add discreet feathery details to dresses and tops. Some of the looks, they presented, you may find rather extreme but there are some that are not. A feather skirt, for example, can be dressed down or up and be worn from day to night, without being extremely dramatic. Pair it with a cashmere sweater or silky top, or even a T-shirt, and let the feathers take the focus. If you think that a skirt is still too extreme for your style, you can try a dress with feather trimmings either on the sleeves, the waist and/or the neck. Or, a feathery top, with a plain pair of trousers. 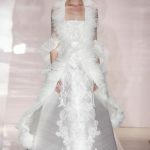 And if your wedding day is fast approaching and still haven’t found your dream dress, why not look for a feathery one? Shoes: The reason most women love shoes is because it is the easiest way to make a statement with the minimum amount of effort. The most boring outfit can be transformed completely with a pair of shoes and especially if those are decorated with feathers. For your wedding day or a night out or, even, a business meeting, your feather shoes will guarantee a flight of sensuality and class.